This document has been prepared in conjunction with many different sources. The objective is to highlight some of the existing online data risks. Managing risk can be completed at work or home following some simple but sensible steps. Use this checklist to review your devices and accounts and amend as necessary. Delete old accounts you just don’t need anymore. Consider all new online activity based on safety that you would ordinarily complete in the real world. For social media you need to consider not just yourself but close friends and family who may be tagged. Review this document throughout the year and ensure this is an ongoing process rather than an annual health check. Always validate suggested links by using a trusted search engine like Google or Bing. Be aware of your surroundings. Shoulder surfing is a known tactic people use to collect passwords. Do not use public Wi-Fi for any sensitive internet browsing unless using an operational VPN. 3G or 4G is safer than public Wi-Fi. You cannot be sure who owns or is monitoring a Wi-Fi hotspot. Never save any account data on any devices that you don’t use exclusively – i.e. others can log onto your accounts if you auto-fill any data and share devices. Turn off Bluetooth and Wi-Fi when it’s not needed, it is a weakness. When undertaking sensitive work related visits or tasks, the use of ‘airplane mode’ is recommended if internet connectivity is not needed. Make STRONGER passwords using the latest guidance from the National Cyber Security Centre. Current best practice advises THREE RANDOM WORDS known as a PASSPHRASE. Add complexity, convert some letters to numbers and add special characters. Aim for 13+ characters. Your single most important account and password is your main email – anyone taking control of your main email can reset all your other passwords locking you out. Always log out of sites you have logged into on shared or public devices. Password recycling – never re-use old passwords. Criminals are known to recycle old passwords which have been exposed via a data breach. Password managers are a GOOD THING. They give you huge advantages in a world where there’s far too many passwords for anyone to remember. They make it easy for you to use long, complex, unique passwords across different sites and services, with no memory burden. They can help prevent you falling for phishing attacks. They can generate new passwords when you need them and automatically paste them into the right places. Think about using stealth mode (e.g. Chrome Incognito, Firefox private window) – be aware they don’t hide what you do from everyone including the other end of the connection. Use a private search engine if necessary. Social Media presents a massive risk to your privacy. We all share far too much information about ourselves. 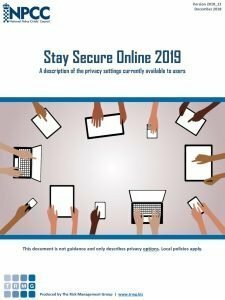 The National Police Chiefs Council have created this booklet which contains screenshot instructions of social media accounts, browsers, smart phones and apps which shows you how to appropriately secure them. Phishing and Spear Phishing are prevalent and responsible for the majority of security incidents. This shows some of common techniques. There are lots of impersonation scams out there…. Data breaches are being reported daily since the General Data Protection Regulation went live on 25/5/18. We are entrusting more and more information about ourselves to digital services. By being aware of the dangers and adopting good online hygiene we can significantly reduce the risk we face. Article 17 of GDPR – Right to Erasure (‘right to be forgotten’) – allows you to require the deletion of information about yourself. The less they know the less there is to be breached. To remove personal data from Google results, make the request here: Google Takedown Request. Microsoft, BBC, Yahoo, Facebook, etc… all have rights to erasure guidance within the help sections on their websites of how to contact the correct webmaster. 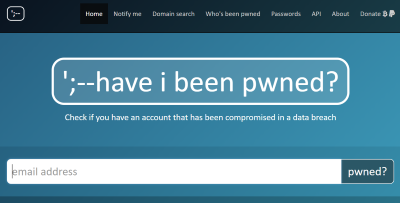 Have I been Pwned is a trusted website run by Cyber Security Researcher – Troy Hunt – who works with the National Cyber Security Centre. You can check if you have an account that has been compromised in a data breach. 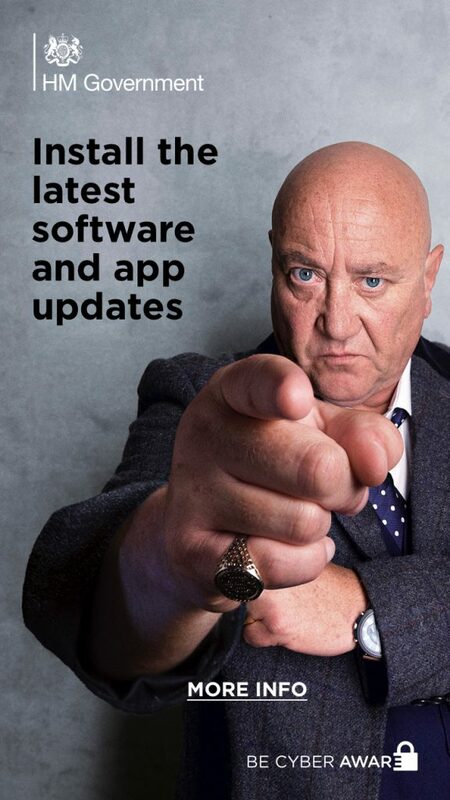 Don’t forget to tick the ‘Notify Me’ box to sign up to future alerts when you are involved in another breach. Involved in a Data Breach? Immediately change your password for all accounts which have been compromised AND any other account(s) that you have used the same password for. Do not use this password ever again. Follow our guidance above. If it involves accounts you no longer use, recover those accounts (using forgotten password processes if necessary) – then delete or close the account. There are lots of free guides which can be found using a simple Google search. Having personal items delivered to work will link your personal account with a new delivery address. Linking work emails to accounts where personal data is stored e.g. social media – will link home addresses to work. Don’t forget to look after the people around you with these useful sites. Please use the following three audit checklists to assist you with a Cyber Hygiene review of all devices and accounts you use or have used. If you print and write sensitive information on it, keep it secure or cross-shred upon completion. Device– List all the devices including mobile phones that you use. Account– List all your accounts e.g. Social media, Email, Bank, Online payment methods, e-commerce, shopping, cloud storage, exercise apps and any other accounts. 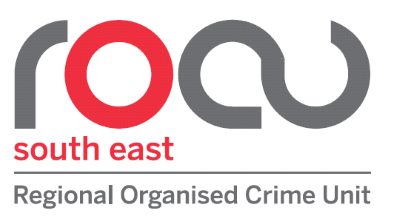 Law enforcement and IT Security companies have joined forces to disrupt cybercriminal businesses with ransomware connections. 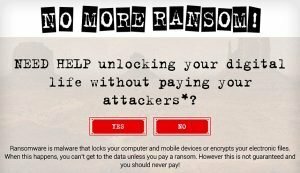 The “No More Ransom” website is an initiative by the National High Tech Crime Unit of the Netherlands’ Police, Europol’s European Cyber-Crime Centre (EC3) and McAfee with the goal of helping victims of ransomware retrieve their encrypted data without having to pay the criminals.